The rate at which security is becoming a daily threat to the universal community demands that you have an incident response plan. 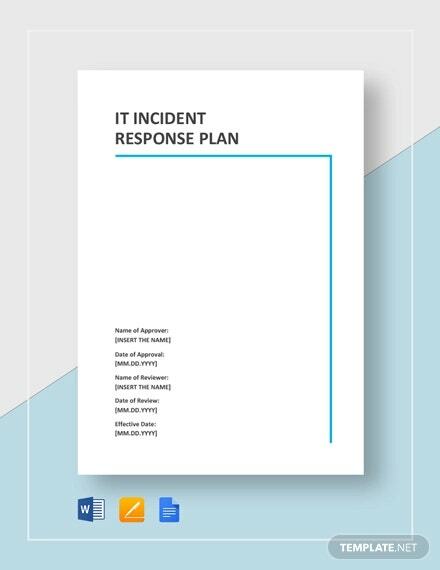 You can use a contingency plan template or an incident response template to create this plan. The plan is an aggregate of written instructions explaining how to detect, respond and minimize the effects of given security risks upon their occurrence. Such threats include data and firewall breaches, malware outbreaks, insider threats and denial of services. You may Also Like Emergency Plan Templates. 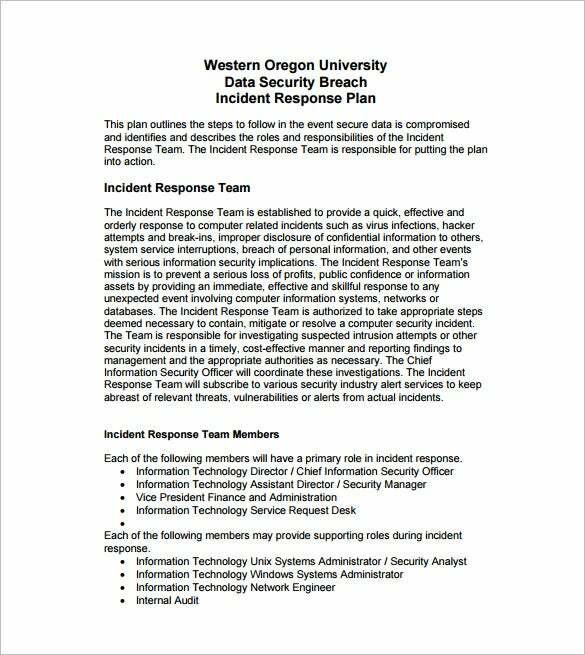 wou.edu | In the eventuality of a security incident in an office or institution, there is need for a response plan. By writing this early and preparing it, updating it regularly, and any security breach incident can be handled fast enough as there is a clear action plan. Sue this PDF template to make it ready. 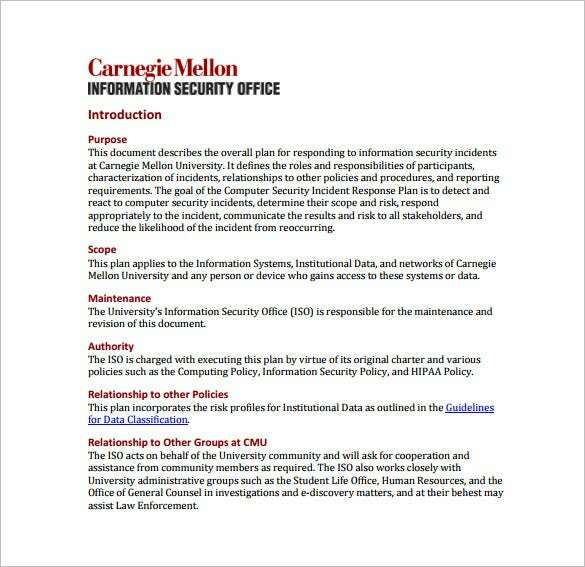 cmu.edu | If you want to have a safe working environment in information security, a fast response plan is required in the case of a security breach at your institution. Download this PDF template today and prepare the plan for responding to any kind of computer incidence. It is relevant to both large and small organizations. water.lasntg.ie | For the sake of a healthy population, the drinking water should always be safe and treated at all times. Any contamination should be dealt with so fast before an epidemic or mass casualty occurs. 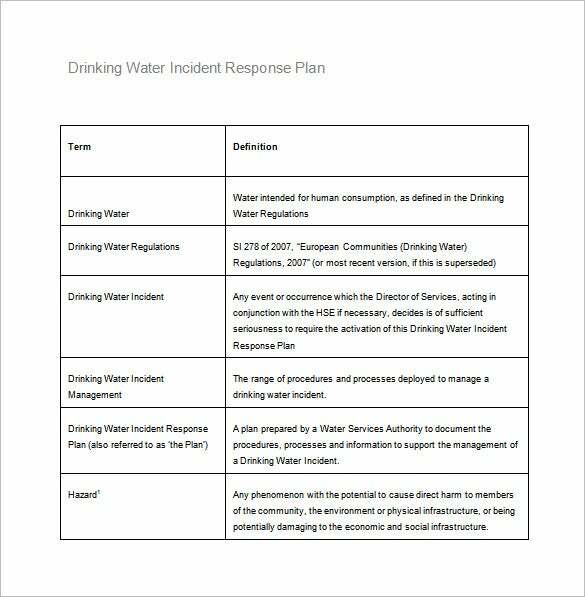 This Word template is designed to help you make a response plan to ensure safe drinking water, continued supply or use of alternative sources. 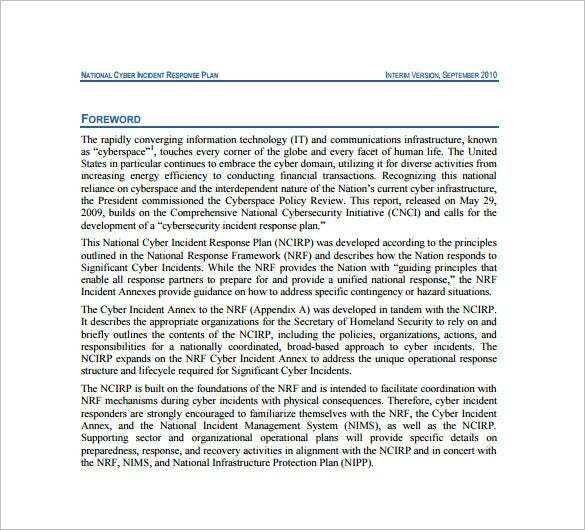 federalnewsradio.com | With the ever increasing cases of hacking into government systems and secured information systems of institutions, there is need to have a response plan in case a nationwide attack occurs. This will ensure services are quickly restored and live goes back to normal for the populations. The template is available in PDF format. 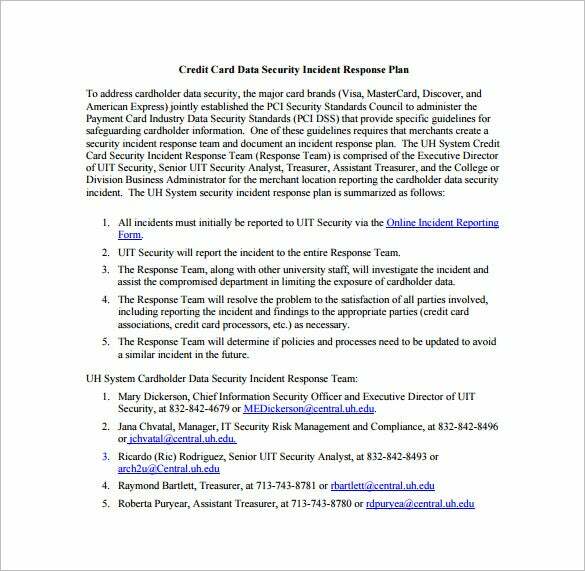 uh.edu | Since credit card thieves are getting better at their game with the passing of time, a response plan is needed in case one day they strike the masses. To prevent serious damage to the economy or loss to clients, banks and governments need this PDF template to make a response plan to handle this before it becomes a crisis. 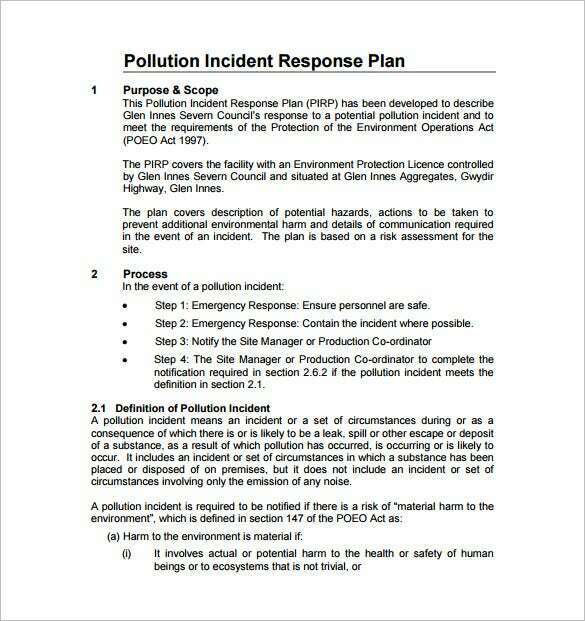 gisc.nsw.gov.au | Since pollution of any kind is dangerous to human life, a response plan to handle it is needed to be in place. This may include, chemical, nuclear or any kind of pollution. 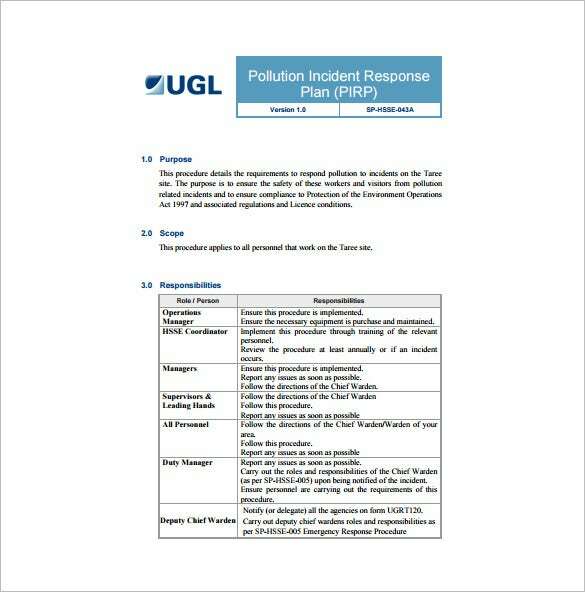 Use this PDF template to make a professionally looking and easy to implement response plan for pollution in any part of the institution or country. A plan template of such kind undergoes six phases: preparation, identification, containment, eradication, recovery and lessons learnt. It is a requirement that IT personnel in an organization must be well-acquainted with all the six levels as well as know and be aware of their role and responsibilities within the core structure of the company. 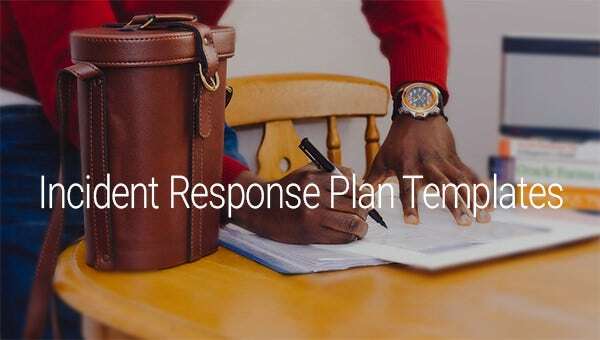 You may Also Like Emergency Plan Templates.